Data Revolution in Healthcare and Lifesciences Industry: mHealth in India- What works and what not? mHealth in India- What works and what not? From remote monitoring to disease management, wireless technology is helping to improve healthcare outcomes and address the healthcare worker shortage. In the U.S., chronic disease treatment costs more than $1.4 trillion each year, but using mHealth could mean a savings of more than $21.1 billion per year. But in India there is this unique pattern of adoption and push that is to be understood. 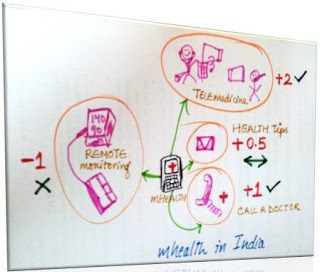 Over the last decade, telehealth in India has been primarily facilitated and driven by government funding. The government now has a majorpolicy initiative in mobile health. However, in pursuing the broad initiative there is a danger that some of the smaller components can get lost, and this is probably what has happened to telehealth. Many government-driven telemedicine programmes have failed to live a long life. It is no secret that these programmes do not have a successful business model and die after the government grants run out. But if you are a medical device, mhealth app or Disease management software company based out of US or Europe eyeing India as a market-> Follow the money-> i.e. Government contracts. 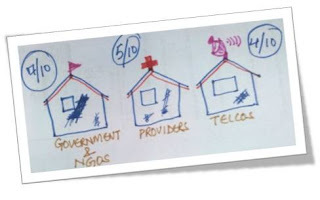 As a mHealth Consultant, we tried several innovations in the country (already 67+ projects in my kitty) and here is the report card as far as stakeholders are concerned. No wonder, the maximum push is from the Government side but the things that are lacking is a concrete business model? So does that mean there is no for-profit model for mHealth in India. The answer is YES, there is but we are still gearing up. I have met several companies from Switzerland, Israel, US and Europe and the whole reason for them to enter the Indian market was cashing on consumerism and scale. Remember, things may not turn out in your favour for the first 3 years if you are working on a for-profit model in India, so you have to be patient and try and work with the right partners and channels. However, quick money is always something that Government tenders provide. As far as services are concerned Remote monitoring in India has not taken up as yet. Below given is a infograph on some of these services and their adoption in the country. Also refer to our survey report on Diabetes monitoring. At this point in time, more than 4 large states in India are looking to set up a Non-emergency help line for consumers and people who live in rural areas and do not have access to basic health. Tele-triage companies from US and Europe have already submitted their interest for the same. Similarly, mobile clinics, telemedicine centres and health information on mobile phones is catching up as priorities amongst Indian Government. We all know about Dr SMS - an initiative of Kerala Government. (Healthcursor Consulting Group has prepared a report on several such reforms that were implemented by Govt. of India from the year 2005 onwards and lessons learnt - available for a price on the website). 1. Patient satisfaction – do patients like the technology? 2. Clinical efficacy – how well we can treat the patients remotely rather than face to face? 3. Business case and sustainability – development of clear metrics to measure the project, including for example decreasing number of transports, reduced rate of hospitalisation and increased productivity. Many of the issues require consideration within the domain of m-health in India are also relevant to other countries. M-health will significantly change the way that health-care is practised in future, and it is clear that it is the human factors that are more difficult to overcome, rather than the technological ones.